This week’s article on NATO expansion focuses on Finland; its security situation within Europe, and its evolving relationship with NATO. Following the end of World War Two, Finland became a militarily neutral state. Though officially a Western market economy, Finland enjoyed a special relationship with the Soviet Union and the West in the Cold War period. This diplomatic balancing act provided lucrative business opportunities for Finnish business which resulted in rapid economic growth in the post war period, placing Finland as one of the highest GDP per capita countries in the post war period. Though never officially becoming a NATO member, Finland has developed a strong relationship with NATO while exercising caution on the depth of cooperation due to its border with Russia. The Finns first began cooperation with NATO in 1994 when they joined the Partnership for Peace program at its inception. At a time when the Russian state was institutionally weak, due to the collapse of the Soviet Union, the Finnish government sought to expand its cooperation with its Western partners. Importantly, the Partnership for Peace program (PfP) provided the opportunity to develop and enhance interoperability with other NATO members and Finland’s armed forces, improving training and tactic sharing between Finland’s armed forces and NATO members. Finland has not, however, limited its cooperation with NATO to the PfP. During the turmoil in the Balkans, Finland contributed militarily in 1996 to The Implementation Force (IFOR), a NATO-led multinational peace enforcement force in Bosnia, which aimed to provide security during Bosnia’s post war transition. Following the war in Kosovo, Finland also provided forces to participate in NATO’s peacekeeping force (KFOR). Moreover, in a move that further involved Finland’s cooperation with NATO, the Finnish Defence Forces International Centre in Tuusula was transformed into a PfP training center for further Finnish/NATO military cooperation. Finally, in 2002 Finland’s armed forces provided support to the US led International Security Assistance Force (ISAF) in Afghanistan. The heightened participation between Finland and NATO can be attributed to the underlying weakness of Russia in this period. Following Russia’s recent military resurgence, Finland’s strategic planning concerning NATO membership and its relations with Russia have come to the fore again. On February 10, 2016, the US military deployed F-15 fighter jets to Finland for the first joint US-Finnish exercises. Just recently the White House has asserted that the United States will quadruple its budget for the security of Europe and its allies in light of Russia’s renewed military exercises and annexation of Crimea in March 2014. The increase in funding is aimed at bolstering US troops across its military bases in Europe and to increase training and exercises with NATO allies. Following growing concerns among NATO allies in Eastern Europe about a potential attack, the new increase in spending in the region is to demonstrate US commitment to the security of the region. Though officially neutral, Finland has been displaying its inclination towards NATO membership amid Russian military actions in the region. Finland’s change in attitude elicited a “friendly” reminder from the Russians that closer relations with NATO would sabotage good-neighborly relations. Although the Finnish government has clearly stated that it has no intentions to enter NATO in the near future, it is not ruling out the potential membership. 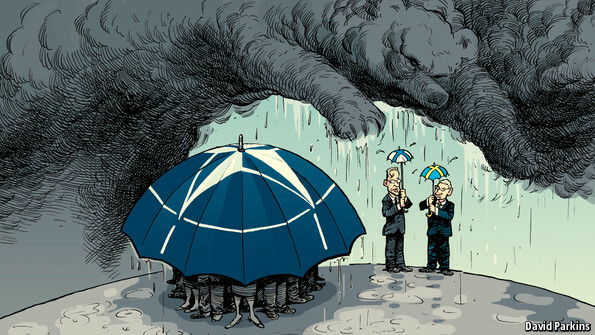 A recent poll in October 2015 showed that 55 percent of Finns oppose NATO membership. With bilateral trade between Russia and Finland dropping sharply since US backed sanctions have taken effect across the EU, Finland has been losing substantial revenue from an important trading partner. Recently, Finland’s Foreign Minister Timo Soini stated that Finland is leaving the question of NATO membership open and stressed that the debate in Finland will change drastically if Sweden chooses to join the alliance: “We think that we must have every door open if needed.” Given the recent deployment of American fighters for military exercises in Finland, and the Pentagon’s expansion of defense spending in Europe, Finland is most likely to stay on the sidelines until a real threat to its borders is presented by the Russians. So far the Russians aren’t interested so long as NATO membership remains uninteresting to Finland.